Some of these van conversions blazed the trail, some are recent additions. What sets them apart is attention to detail, clever techniques for solving problems, and adaptations based on what their owners use the vehicles for. We’ve previously said that it’s really hard to be stealthy in a Sprinter. This build pretty much proves us wrong. Although we couldn’t live with the lack of windows, this Australian van served as home for two people for a couple of years. 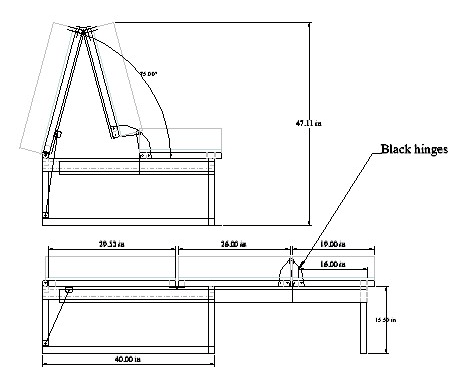 The bed with its raising mechanism visible at the far end (photo from the Stealth Sprinter site). Note how the sides of the bed line up with the backs of the couches it rests on. Fancy-pants design touches include a bed that disappears into the ceiling, the simple-yet-functional under-couch storage, and the lovely finish on the cabinetry. 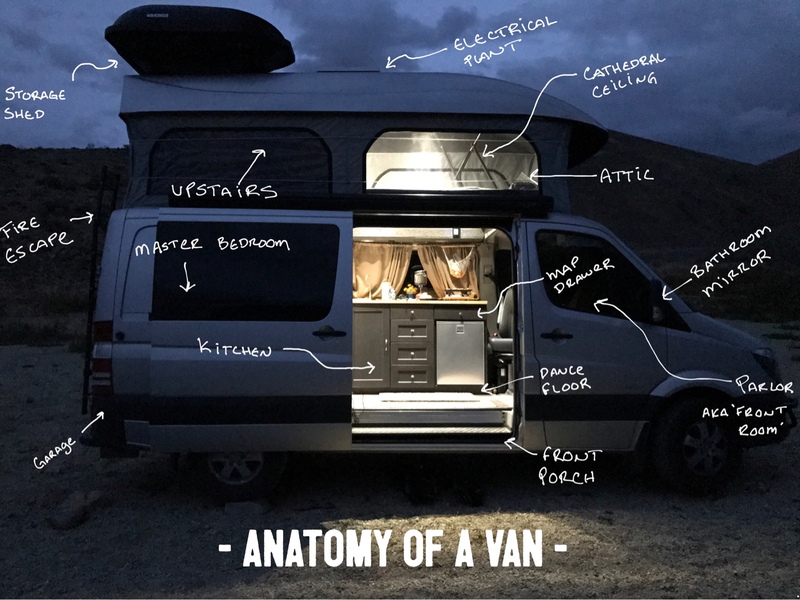 This Moving House is a UK build-out of an extended LWB van with an unusual way of getting one double bed and two single beds into the back area, while still leaving room for two surf boards under the bed and a stroller on top. The beds are only full height from the waist up and your legs slide into a space only as high as your hips are wide. Importantly this enables you to sleep on your side or roll over without getting wedged or tearing your kneecaps off. Using this space saving technique 3 tiers of sleeping can be cunningly shoe-horned into the available area. He admits that he hasn’t worked out how to get into the topmost bed (with the port hole). There also doesn’t appear to be a whole bunch of storage space for clothes, food, etc., but it’s still a really nice looking build. Back in 2011 when he was writing this build up, 80/20 wasn’t a large part of many people’s builds. Geek managed to make it look less industrial and more modern. His cabinet paneling is actually click-lock flooring, routed to fit into the 80/20 grooves. His build thread shares his thought processes, his many questions to the forum, and the answers that folks provided. You can spend a couple of hours reading through the whole thing! Later, he Plasti-dipped the entire outside of his van. The build thread is pretty quiet these days because he’s out enjoying his van. Hein runs a company that specializes in CAD/CAM work. So it was only logical that he’d create his van interior using those tools too. The Celtek and HDPE plastic cabinets are a smooth, sanitary style. The clean lines and attention to small details make this a build that’s worthy of comment. You can see his full build thread on the Sprinter forum. Hein has also been known to make parts for other people. He’s the sole source of Thinsulate for the North American conversion van community too. George has used a lot of 80/20 aluminum extrusions in his build. 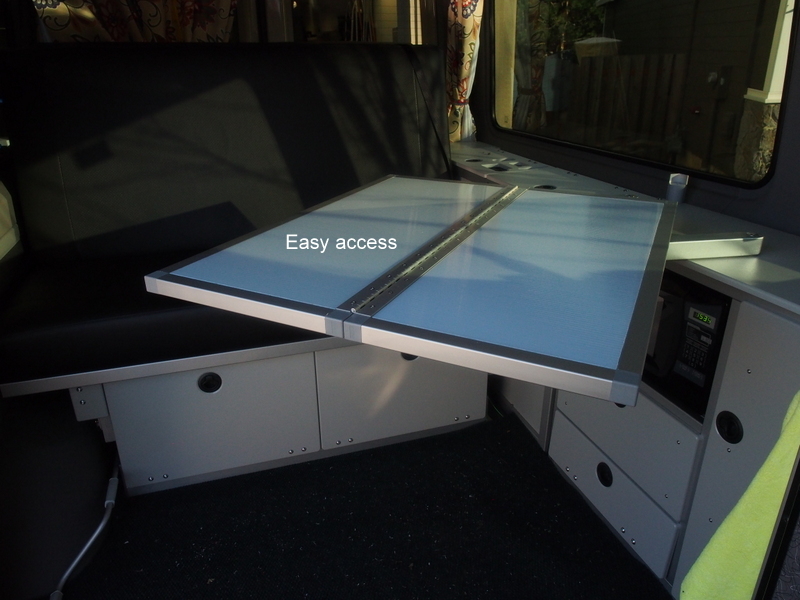 Two highlights are the 80/20 folding sofa bed and amazing fold-out 80/20 table. His whole build is worth reading through (it’s a long read!) 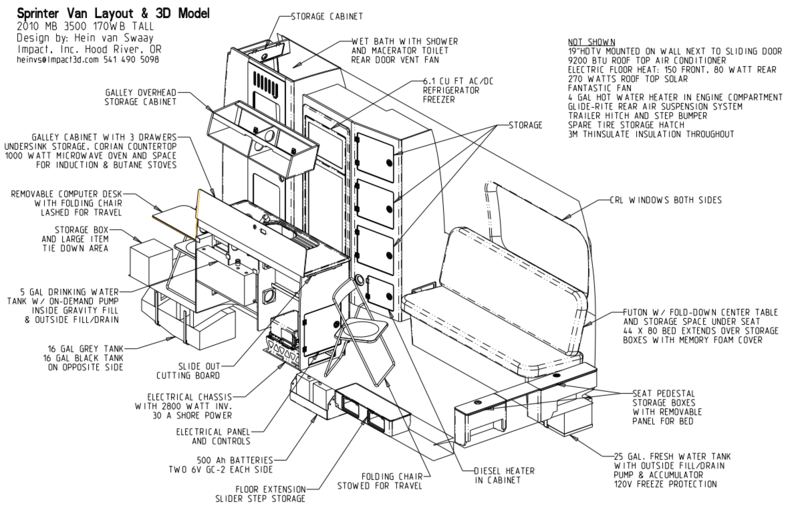 because it covers his thought processes and many details for each of the systems (electrical, plumbing, cabinetry, etc.) that he installed. Dave is building out a Transit van now. Before that though he was one of the Sprinter forum build thread pioneers, especially when it comes to 80/20. Watching him and GeorgeRa fight over whether it’s better to make your own fittings or buy them from the 80/20 store is always fun! He started many threads on the forum to describe his build. This advanced search for keywords “Orton DIY” where the user name is “Graphite Dave” should list most of them. 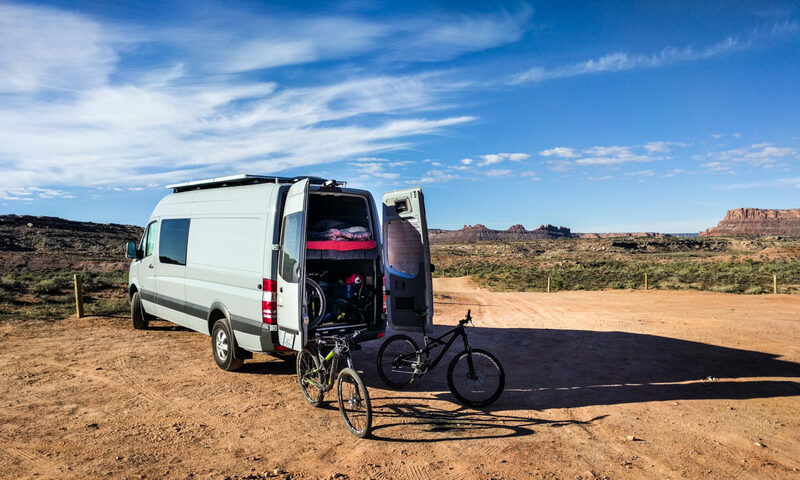 Midwest Drifter is currently traveling across Australia in a T1N van he put together in the USA and shipped across in a container. His build thread is pretty detailed and includes some touches you may not see anywhere else. For instance using bedliner-type paint on the entire outside of the vehicle! He’s also running an air conditioner from 12v batteries – quite the achievement! 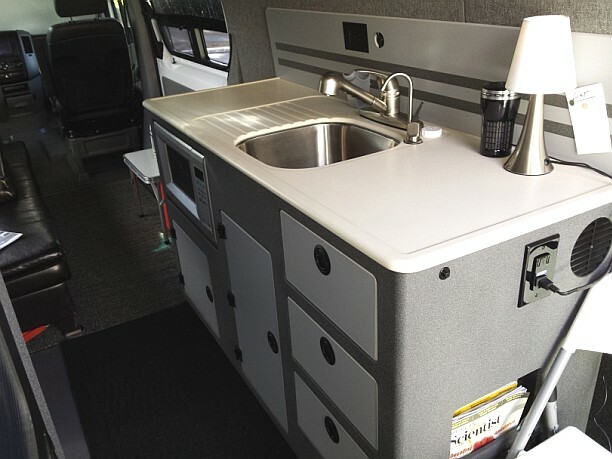 The Wanderweg van uses a Colorado Camper Van pop-top and is finished out inside really nicely. Beatle-kill pine is too log cabin-like for our tastes, but this is a particularly good implementation. That wood and the cabinetry makes the van heavy though! They added air suspension and a heavy duty sway bar in the rear. There are more build details on the Sprinter Forum too. This van shows how attention to detail can really make the difference between a run-of-the-mill build and something that people go nuts over. These guys get enough press without us needing to point them out to you, but they do deserve to be in the list. Even if some of their designs are flakey (for instance solar panels that would be constantly shaded by the roof racks around them), they do high quality and visually very appealing work. They were one of the first companies to specifically market Sprinters to the outdoors crowd. Now there are several other companies in this space, but OSV are the company everyone seems to compare against. Check back occasionally, because we’re likely to add to this post as we see other interesting builds on our travels around the interwebs. If you know of a build that should be in this list, let us know in the comments. The adventure wagon soft bins are brilliant!